• Found in all the timber producing areas of West Africa from Ivory Coast to Gabon and Cabinda. Primarily it is found in the Ivory Coast, Ghana, and Nigeria. Unlike other Khaya species which do not require much rainfall, it is reported to grow in the rain forest in low-lying areas within its range. • A genus of seven species of trees in the mahogany family Meliaceae. All species become big trees 100 -115 feet tall, rarely 145 feet, with a trunk over 40 inches in diameter, often buttressed at the base. 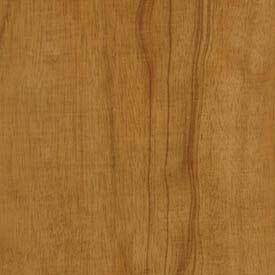 African Mahogany has a moderately straight grain pattern. This material can vary significantly between light brown and light red to deep brown and deep red. 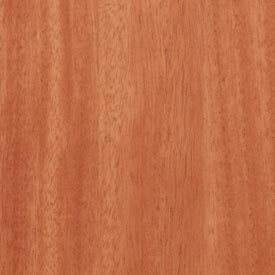 Of all types of Mahogany offered, this is our most popular choice. African Mahogany Finish Grade is designed to be used when having your products finished by Decore-ative Specialties. With Finish Grade materials you will receive the material option that best suits the look you have selected, whether you choose a natural, stain, shader, or paint finish. As a result, the amount of natural color or grain may vary depending on the selected finish. Ribbon Grain African Mahogany, also known as Quarter Sawn African Mahogany, shows a more "ribbon striped" appearance than straight grain African Mahogany. Its color can vary significantly from a light brown and light red to deep brown and deep red. Ribbon Grain African Mahogany Finish Grade is designed to be used when having your products finished by Decore-ative Specialties. With Finish Grade materials you will receive the material option that best suits the look you have selected, whether you choose a natural, stain, shader, or paint finish. As a result, the amount of natural color or grain may vary depending on the selected finish.